In My Kitchen Garden: Preserving the Harvest: How to Freeze Sweet Peppers - No Special Equipment or Boiling Water Required! 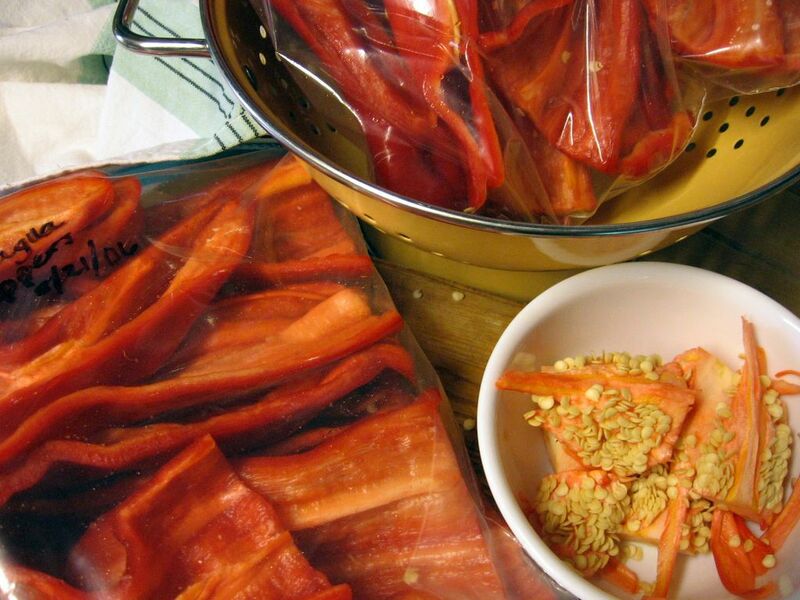 Preserving the Harvest: How to Freeze Sweet Peppers - No Special Equipment or Boiling Water Required! Is there anything more beautiful than edible homegrown bounty? 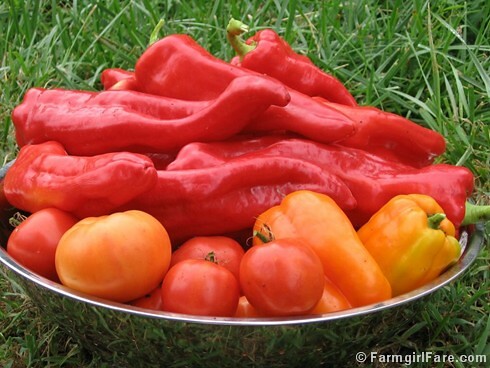 Update: For tips on planting and growing sweet peppers, check out these posts. Happy growing! Much of the garden may be in a pitiful state, but my sweet Aconcagua peppers haven't failed me yet. I've probably tried growing at least fifteen different heirloom varieties of sweet peppers from seed over the last twelve years. Red, orange, yellow, purple, short, fat, tall, thin, you name it, including a few with names I could barely pronounce. So after all that exploration into the world of sweet peppers, how many kinds will you find in my garden today? Just two. Yep, that's it. Sometimes a girl just has to quit experimenting and settle down with a couple of dependable favorites. Aconcagua is one of those two. (Orange Sun bells is the other.) Year after year—while the fate of nearly everything else in my garden is uncertain—I always end up with tall, healthy plants loaded down with large, beautiful peppers (knock on wood). The plants require nothing more than some nice, fertile soil (I amend mine with lots of sheep manure), a layer of mulch such as grass clippings (unless you find pulling weeds relaxing), water at regular intervals, and something to support the plants because they will grow 3 to 4 feet tall and tend to fall over when weighted down with ripening peppers, especially during heavy rainstorms. I tie them to bamboo stakes with recycled baling twine. Pests are rarely a problem, although the blasted blister beetles have been attacking several of my plants this year. They've only nibbled on the leaves so far, and haven't devoured enough to kill off any of the plants. While I don't recall any pepper plants being plagued by disease, this year I have found a couple of unripe peppers simply rotting away on the vine for no apparent reason (and they weren't touching the ground). The same thing is happening with the Orange Sun bells, though, and since the majority of the peppers aren't doing it, I haven't bothered to look into this. Weird, unexplainable stuff always goes on in my garden. I've been saving seeds from my best peppers for years, but the original seeds were purchased from Baker Creek Heirloom Seeds, and they have this to say of Aconcaguas: "Very large, long, frying peppers, up to 11" x 2½". Tall plants give good yields over a long season, and the fruit is very sweet and delicious! This pepper was named after Mt. Aconcagua in Argentina." A packet of 25-50 seeds will set you back $1.35. The pepper on the left in the photo is 8 inches long and weighs half a pound. In the summer, I tend to eat most of my sweet peppers raw--either cut into chunks and tossed into salads or cut into slices and dipped into something like herbed yogurt cheese or homemade blue cheese dressing. Today I added a couple to a batch of Summer In A Bowl. These are also the peppers I use when I make my Simple Summer Harvest Soup. They do cook up quite nicely, though (notice Baker Creek even calls them "frying peppers"), so what I do is preserve much of my harvest for cooking up later in the easiest way possible—I freeze them. No fancy equipment or giant vats of boiling water—like I had in the kitchen today to put up tomatoes—or special containers required. This is how a hot, tired, and lazy gardener freezes her peppers and saves her own pepper seeds. Take a sharp knife and slice off the stem. Then cut the pepper in half lengthwise and pull out the seeds. Be sure to save the seeds from your best looking specimens. Simply detach them from the membranes and, if they seem a little moist, put them in a nice dry spot for a while. Otherwise stick them right into a little labeled storage bag. I either use itty bitty zipper seal bags or reuse the paper envelopes the seeds I ordered came in. That's it. You're now ready to grow an even better crop of peppers next year. Isn't it nice when something is so easy? Just 'spoon' the halves together and pack them tightly into the bags so you don't have a lot of extra air inside. Seal them up, label, and toss into the freezer. Done! The peppers won't freeze into a massive clump, so you can pull out just a few halves at a time if you like. (If for some reason yours do clump together, spread the pieces out on a baking sheet and freeze until solid, then pack in freezer bags). Your frozen peppers can be added to practically anything: soups and stews, chili, omelets, fritattas. You can fry the whole halves up in olive oil or roast them in the oven with lots of other veggies or just some little halved potatoes. You can chop them up and add them to salads. Basically you can do anything with them that you could do when they were fresh, but now you can do it during a snowstorm. This is important, as it is what makes all of this hot and sweaty and dirty work worthwhile. There is nothing more delicious and rewarding than being able to enjoy instant homegrown food in the middle of winter when the garden is covered with a sheet of ice and you can barely remember what a blister beetle even looks like. © FarmgirlFare.com, the year round foodie farm blog where Farmgirl Susan shares recipes, stories, & photos of her crazy country life on 240 remote Missouri acres - and the freezers are always full. I am really enjoying your blog(s) -- found them through another blog, don't remember now. I garden in a small town and have convinced my husband that we do need two more very large boxes (in addition to the three I already have), so I get a good crop for our little three person family. I showed him your blog right away -- it is something we hope to do at some point in our lives and you write about it so well. Question for you -- do you blanch your green beans? I have a bumper crop of yellow wax beans and also Painted Lady runner beans and am not sure if I have to blanch them first. Can't find a lot on prepping them -- then saw you mention your green beans and thought I'd ask. Beautiful peppers! My peppers are being slowpokes this year. your pepper story is my tomato story. i planted 5 different kinds of tomatoes and have received a relatively low yield (partly due to making the big mistake of planting tomato plants in the same place, partly due to @#$# birds who like to "sample" my tomatoes). the upside is, now i have a huge bounty of okra this year. gumbo, anyone? btw, i look forward to your blog when it's updated. it's great when you share your experiences (whether they be successes or failures). Eunice - I'm also having a good okra year!! I've never had much luck with it in the years I've tried, and even though I'm giving it zero TLC and letting it be overwhelmed by weeds, my okra's still cranking out pods! Oh Yummy!! Those peppers look delicious. I love your blog...like Kate I found it quite by accident. I had no idea you could freeze peppers that way. I always assumed they'd turn to mush. Are you planning a blog entry about putting up tomatoes? I'm determined to try this for the first time this year. Next year, you might try planting a match under your pepper plants. It worked for me! I used to get that rot, but an old Southern guy told me to put an unstruck match under the transplants and you won't have any more rot trouble!! I have no luck with bell peppers at all, so I definitely favor the fryers. And, of course, tons of hot peppers. we have an heirloom pepper this year, georgia flame (which is not sweet, but hot) . it is remarkably tall and we also have had to support it. it also took a long, long time to flower in earnest. or at least it seemed that way-- now, it is covered in future peppers. the base of the stalk is over an inch in diameter! quite a plant. the blister beetles are ignoring our pepper in favor of the chard and the tomatoes. i hate those evil little creatures. they are everywhere. Yes, I do blanch my green beans before freezing them--2 to 4 minutes in boiling water, depending on the size of the beans (lately I've just been growing the narrow filet beans so 2 minutes). Then immediately put them into a large bowl of ice water to stop the cooking process. Drain cooled beans in a colander and put in a freezer bag or seal with a FoodSaver. I find that using the FoodSaver makes a big difference with the beans (whereas I don't see as much difference with the red sweet peppers so I don't bother). To serve I either defrost them completely or (if I've forgotten to pull them out of the freezer) put the sealed bag in some warm water. Filet beans defrost pretty quickly, and you can even start heating them up while half frozen. I put a small amount of water in a saucepan, let it come to a boil, and then add the beans, put on the lid, and basically just let them warm up (you pretty much cooked them during the blanching process). It takes maybe 3 to 4 minutes. Gosh, I should have made a post out of this! I actually have a photo of some sealed bags of beans I've been meaning to share--along with this info. Slowpoke peppers sound perfect since you've been rushing to deal with everything else that's been ready early. Rotating your crops--especially tomatoes--is really important. Wherever you planted tomatoes this year, next year don't plant anything from the tomato/squash/pepper/melon families. Hoarding is definitely necessary sometimes--and besides, it'll just make the people you forced all those tomatoes on during previous years to appreciate them that much more when you do get your next bumper crop! Okra? Sorry, not a big fan. Glad yours did so well, though. And thanks for letting me know you enjoy my blog--feedback is the only way I know if what I'm writing is of interest! And negative feedback is welcome, too--you can always leave an anonymous comment if you like. Oh, before I forget one more time--your comment about the skunk and the Oreos and how they get that color was literally one of the funniest things I have ever heard. Thank you so very, very much for the laugh. That was absolutely priceless! Ha ha, just yesterday I looked at my countertops covered with tomato putting up paraphernalia and thought, "I should take a picture of this--everything is all set up." And then I blew it off. Yes! Definitely put up some of your tomatoes this year. And if the whole canning process scares you, do what I do and freeze them in plastic freezer containers. I'm hoping to write about this tomorrow, but basically you blanch the tomatoes in boiling water, plunge them into an ice bath, drain, peel off skins and squeeze out seeds, and then take what you are left with (which will be a fraction in volume of what you started with) and pack them tightly into the freezer containers. Label, toss in freezer, and you're done! That just sounds bizarre enough for me to have to try it. Thanks! I've definitely had consistently good results with these peppers--and I really like the flavor. They aren't super sweet (that's what the orange bells are for), but they're very nice and, as I mentioned, freeze beautifully. Huh. I wonder why you have so much trouble with bell peppers. A Farmgirl's Favorite Seeds List is a great idea. Little by little, I'm getting this blog organized so that you can easily go back and look up helpful articles, etc. I'm figuring that this fall and winter when there isn't as much going on in the garden I will (hopefully) have some time to basically catch up with a lot of things I wanted to write about but didn't get the chance. Stuff that will be helpful for next year's gardens. And a list of favorite seeds fits right in with that because you know in the blink of an eye those 2007 seed catalogs are going to start arriving! This is definitely the absolute worst year I've had with the blister beetles. They are STILL out there demolishing things. The chard was history ages ago--geez they love that stuff. They're eating things now I've never seen them eat. Hopefully next year we'll get a reprieve. Usually they don't stick around this long either. The come, they destroy, and they go. This year they're still at it. Your pepper plant sounds wild. I always try to get my peppers in the ground as soon as possible because they do take a fair amount of time to produce the ripe peppers. It's always a shame when it starts getting cold and frosty and I have plants full of halfway mature green peppers. Funny -- I just wrote that I had fried up my sweet Italian peppers with onions and Italian sausage for dinner, then I clicked over to your blog (you're on my blog roll) and saw those beautiful red peppers. Does the same freezing technique work with jalopenos? I have beyond a bumper crop. Tadaaa... today I made my first batch of Summer in a Bowl. OMG delicious the instant I finished stirring, my taste buds were so happy. Thanks for sharing your recipe. By the way I used heirloom tomatoes I got at Whole Foods yesterday. As I was cutting up these glories of summer I recalled how as a child I hated picking those green horny worms off the tomatoe plants. Now if I can only remember this type of pepper next year. I've never had any peppers that really produced that much. I plant them every year with high hopes and get only about 6-8 peppers per plant. Need to try these! I think peppers are one of my favorite veggies. Thanks Susan for all of your posting! You continually inspire me! I just posted looking for Aconcaguas peppers. I just found them at Pinetree Seeds. Thanks anyway. For kate and the green beans. My wife grows a haricot vert. We picked them young and tender and freeze them. When I cook them I stir fry them. This help recapture the crispness. Just a small amount of olive oil in a cast iron skillet and throw in the frozen beans. thanks for the great tips on putting up my banana peppers, just now turning red.... Will share a "tomato Tip".... I put up(FREEZE) about 25 gallons of marinara sauce each year from my garden of 40 plants.... The easiest way to do such a large number is to core and wash your whole tomato, throw them in the freezer until they are frozen hard... rinse under warm water in the sink, the skin just falls off, and throw the frozen tomato balls into a large pot to slowly cook down... no chopping, no lose of a drop of the juices... it works perfect!! !